Diplomats from over 100 countries met in Geneva, Switzerland on Monday to discuss why the United Nations’ landmark Arms Trade Treaty (ATT),which came into force three years ago, has so far failed to stop the flow of weapons to the world’s war zones. Celebrated as a paradigm shift in the regulation of the international arms trade, the ATT now looks like a disappointment, according to statements issued by NGOs instrumental in campaigning for it and then drawing it up. Retours sur le premier jour de la troisième conférence des Etats parties au Traité sur le commerce des armes (TCA), qui se tient actuellement à Genève, et sur laquelle il semble souffler un vent d’optimisme. This week diplomats meet in Geneva to discuss the progress of the Arms Trade Treaty (ATT), the world’s first treaty regulating the international trade in conventional weapons. For people in countries like Yemen and Iraq where weapons are fuelling deadly conflicts, this meeting is nothing short of an emergency. The third annual Conference of States Parties of the Arms Trade Treaty is being held this week in Geneva, Switzerland. As I pointed out on Thursday, many of the nations that are party to the treaty, which purports to require regulation of the conventional arms trade, aren’t even paying their bills. Shell itself took action to provide the police force with arms. In the period in which the setting up of OPAPCO and the expansion of Shell’s police force were under discussion SPDC’s security adviser Victor Oteri asked the regime for consent to import more than half a million dollars of arms. In a break from the pattern of supplying raw materials and agriculture to the Middle East, South Africa is also pushing defence equipment, with some success. The Algerian military has acquired Buk-M2E surface-to-air missile systems, which were seen during a recent exercise. Ghana’s weapons and ammunition experts are meeting in Ho in the Volta Region to discuss ways to approve a list of weapons and ammunition that will be allowed to enter or leave the country. Après la décision de la Libye de fermer ses frontières, le Soudan ferme ses frontières terrestres avec le Soudan du Sud, le Tchad et la Libye. Le Soudan a annoncé, mercredi sa décision pour dit-il lutter contre la contrebande d’armes. The Nigeria Customs Service has seized a container conveying 1,100 rifles at the Tin Can Island Port. While disclosing the seizure to newsmen in Lagos on Monday, the Comptroller General of NCS, Col. Hameed Ali (retd. ), stated that the rifles were discovered on September 6 by the operatives of the NCS intelligence unit. The Tin Can Island Command of the Nigeria Customs Service on Tuesday uncovered another container suspected to contain yet another cache of arms imported from Turkey. Research released by Amnesty International today reveals how a shell company in the heart of London’s West End acted as an intermediary in huge prospective arms deals to war-torn South Sudan and other countries, thanks to regulatory gaps which are making the UK a hotspot for companies involved in illicit arms transfers. Ukrinmash refutes the allegation as to transfer of arms and provision of any material-technical aid to South Sudan, including equipment, its maintenance and training. Suite a une plainte déposée par des ONG, le parquet de Paris a annoncé ce lundi 25 septembre, ouvrir une enquête à l’encontre de la banque BNP Paribas, pour complicité de génocide et de crime contre l’humanité au Rwanda, révèle France 24. Two out of the five men being prosecuted by the Federal Government for unlawful importation of 661 pump-action rifles into the country have indicated their intention to enter into plea bargain with the prosecution. Turkish Ambassador to Nigeria, Mr Hakan Cakil, has promised to launch an investigation to fish out those behind the illegal importation of firearms from Turkey to Nigeria. The Comptroller-General of Nigeria Customs Service, Col. Hameed Ali (retd. ), on Tuesday met with the Turkish Ambassador to Nigeria, Mr. Hakan Cakil, over the recent seizures of pump-action rifles imported illegally into the country from Turkey. South Sudan government on Thursday welcomed a statement by the Ukrainian government, denying that its state service of export control did not permit any company involved in arms deal to export arms to any nation, including South Sudan. More revelations have continued to trail Great James Oil and Gas Limited, the firm linked with the illegal importation of 1,580 guns into Nigeria. On September 11, the men of the Nigeria Customs Service intercepted a 20-foot container at the Tin Can Island Port with 1,100 pump-action rifles concealed in wash basins. There are strong indications that the Nigeria Customs Service may have sidelined the police in its investigation into the series of illegal importation of arms into the country. The House of Representatives yesterday summoned the Comptroller General of Nigeria Customs Service (NCS), Col Hameed Ali (rtd), to explain how to rid the country of the menace of small arms and light weapons in the polity. L’armée égyptienne a déjoué une tentative de contrebande en saisissant 10 véhicules chargés d’armes, qui tentaient de franchir la frontière égyptienne depuis la Libye, a annoncé jeudi un porte-parole de l’armée. Au Tchad, la police a interpellé, ce week-end, plusieurs acteurs du secteur de l’aviation, dans le cadre d’une enquête sur des trafics présumés d’immatriculations tchadiennes. Des avions immatriculés au nom du Tchad et utilisés par des trafiquants d’Europe de l’est se seraient retrouvés en Syrie. Une situation que Ndjamena cherche à élucider. Selon des informations révélées par la Lettre du continent, ce sont les services américains qui ont décelé l’anomalie et ont demandé des explications aux services tchadiens. Juda Allahodoum, directeur de publication du journal « Le Visionnaire », a été arrêté au Tchad mardi 17 octobre 2017, suite à la parution d’un article consacré à une affaire de détournement présumé d’immatriculation d’un avion. Canadians were not overly surprised last week when video evidence emerged of Saudi Arabia allegedly using Canadian-made armoured vehicles against its own people. The news came and went with the usual proclamations from Ottawa: Foreign Affairs Minister Chrystia Freeland was “deeply concerned,” promising an investigation and action if any “serious human rights violations” are found. Canadians seemed to say okay, and went on with their morning Timmies. Here’s an idea. Let’s sell shiploads of heavy weapons to a repressive autocracy run by a single, stupendously rich family not accountable to anyone. What could possibly go wrong? Nevertheless, that’s what your Canadian government did, apparently thinking that powerful armoured vehicles could be sold to a regime like Saudi Arabia but not be used against internal enemies or religious minorities. Goaded by incontrovertible red flags and the heightened scrutiny of media and civil society, Global Affairs Canada has announced an investigation into recent reports of the use of Canadian-made military equipment to violently suppress protest in Saudi Arabia’s Eastern Province. As set out in this report, the legal structure around Honduras’ arms trade is deeply flawed. The legislation is inconsistent and unclear as to the roles of different institutions, while the regulatory system is insufficiently funded, anachronistic and administered by officials who are overworked or susceptible to corruption. John Roberts, 27, of Clarksville, Tenn., was found guilty today by a federal jury of conspiracy to steal and sell U.S. Army property, 10 counts of wire fraud and two counts of violating the Arms Export Control Act, announced Acting U.S. Attorney Jack Smith of the Middle District of Tennessee. The Pentagon’s battle against ISIS relies on an Eastern European arms supply-line operated, in part, by firms and executives linked to fraud, foreign bribery, Bulgarian organised crime and the death of a contractor. IDEF 2017 occurred in May of this year, but we missed this important Turkish development when it comes to ammunition. MKEK, the Turkish state-run armament company, and privately owned Aselsan signed agreements at IDEF 2017 to cooperate on the design and manufacture of “Smart” 40x46mm Low Velocity for use in UBGLs or stand alone launchers employed by the Turkish Military. Iran’s Revolutionary Guards have started using a new route across waters in the Gulf to funnel arms to Houthi rebels in Yemen, Western and Iranian sources say. On August 2, 2017, the United Arab Emirates (UAE) Ministry of Foreign Affairs released an official statement condemning North Korea’s intercontinental ballistic missile launch into Japan’s exclusive economic zone. The UAE described North Korea’s actions as posing a “genuine threat to international security and stability,” and emphasized the importance of upholding international law as a bulwark against nuclear proliferation. The state has taken the position before the High Court of Justice that there is no evidence any Israeli individual or entity has committed a criminal offense by exporting weapons to South Sudan. The Defense Ministry is checking reports that the Israeli firm Aeronautics Defense Systems had been asked by Azerbaijan to carry out a live demonstration of an armed unmanned aerial vehicle against an Armenian military position. In the past few years, the European demand for arms has increased due to the significant security challenges that have developed throughout the continent. This trend has also resulted in a marked increase in Israeli defense exports to European countries, which is expected to continue in the years to come, especially to Eastern Europe. This development requires that Israel act cautiously—among other reasons—in order to avoid a direct diplomatic clash with Russia, which is the primary reason for the current European armament. China main tank and armored vehicle maker Norinco has shown several new armored vehicles for the export market. The Defense Ministry has suspended the export license of Israeli firm Aeronautics Defense Systems following an investigation into claims Azerbaijan asked it to carry to out a live demonstration of an armed unmanned aerial vehicle against an Armenian military position last month. North Korea has been singled out alongside Saudi Arabia and Iran as one of the world’s most secretive major exporters of small arms, including Kalashnikovs, rockets and machine guns, in a report by experts in Geneva. A leading Ugandan newspaper made a splash this week with the front page headline: “Israel sends 1,400 refugees to Uganda”. The behind-the-scenes deal between Israel, Uganda and Rwanda has been exposed for some time in Israel, but Uganda officially continues to deny its existence. It’s therefore significant that Sunday Vision, a paper owned by the government, has publicized – and legitimized – the story. Israel’s High Court is set to rule on Wednesday on a petition against weapons sales to Myanmar. The court decision will remain secret because the judges hearing the case – Yoram Danziger, Anat Baron and David Mintz – issued a gag order on it at the request of the state. Israel’s High Court ruled Wednesday on a petition against Israel’s weapons sales to Myanmar. However, the court decision must remain secret. Pakistan is one of the main destinations for China’s arms exports while the country is rising in the arms trade, defence experts said. Bahrain announced a $3.8 billion with US military aircraft manufacturer Lockheed Martin on Tuesday, but it might also be close to striking a deal with another rival military power – Russia. On July 19, the Trump administration announced that it would end the CIA’s covert program aimed at arming and training terrorist-linked “moderate rebels” in Syria, sparking hope among some Trump supporters that he was finally enacting the anti-interventionist rhetoric of his campaign. The U.S. Pentagon and State Department have devised plans to supply Ukraine with antitank missiles and other weaponry and are seeking White House approval, U.S. officials said, as Kyiv battles Russia-backed separatists and ties between Moscow and Washington fray, according to The Wall Street Journal. Britain’s largest defence firm has made $733m in six months, and expects further growth, in results posted weeks after surviving a High Court challenge to its multi-billion-dollar arms deals with Saudi Arabia. In a recent high profile judicial review claim, Campaign Against Arms Trade (CAAT) challenged a decision of the Secretary of State for Trade. Amnesty International, Human Rights Watch, Rights Watch (UK) and Oxfam all intervened. In its judgment, the Divisional Court emphasised judicial self-restraint, and confirmed that the courts must give suitable recognition to the institutional competence of those charged with complex evaluative decision-making. The European Union is giving millions of dollars of “research” funding to a company that is helping Israel evade an international ban on cluster weapons. Government figures show military equipment was approved for sale from UK-based companies to Venezuela’s armed forces as recently as September last year, despite the Foreign Office listing the country as “of concern” regarding human rights. The British government saw Iraq’s invasion of Kuwait as an “unparalleled opportunity” to sell arms to Gulf states, according to recently declassified secret documents. Bulgaria’s Economy Ministry has taken action to gain control over the Dunarit arms factory, which risks losing its licence to trade over various court battles. Where do German guns sold all over the world end up? The government is now checking that arms exports stay where they’re supposed to – but only if the country that bought them agrees. Critics ask: what’s the point? Germany’s most notorious gun manufacturer, Heckler & Koch, has vowed never again to sell weapons to non-NATO and EU countries – though it has not announced the strategy. It is the first arms firm ever to do this. British government ministers are scheduled to give keynote speeches to international arms dealers at DSEI — the world’s biggest arms fair — in London’s Docklands this September. The participation of high-ranking Conservative ministers once again highlights the thin line between government departments and the arms industry. Exiled Bulgarian banker Tsvetan Vassilev, whose extradition from Serbia is sought by the authorities in Sofia, told BIRN that moves to nationalize the arms firm Dunarit – which has been linked to his former business empire – would be a crime. Das US-Militär hat offenbar zeitweise über seinen Stützpunkt im rheinland-pfälzischen Ramstein Waffen und Munition aus Osteuropa an syrische Rebellen geliefert. Da entsprechende Genehmigungen der Bundesregierung fehlten, haben die Amerikaner womöglich deutsches Recht gebrochen. Das haben monatelange Recherchen der und der Journalistennetzwerke Organized Crime and Corruption Reporting Project (OCCRP) und Balkan Investigative Reporting Network (BIRN) ergeben. German arms producer Heckler & Koch has promised to stop sales to warzones and countries that violate corruption and democracy standards. Veteran anti-arms-trade campaigner Jurgen Grasslin told Radio Sputnik that because exported arms often end up in the hands of terrorists, arms sales should be banned altogether. Washington’s air base in southwest Germany was used for a time to store and send weapons to Syrian rebels, according to a German news daily. If the report proves true, the US could have violated German law. Die Staatsanwaltschaft Zweibrücken lässt prüfen, ob die Amerikaner vom US-Militär-Stützpunkt Ramstein aus Waffen an syrische Rebellen geliefert haben. Sie hat die Wirtschaftsabteilung der Staatsanwaltschaft Kaiserslautern beauftragt, dem nachzugehen. A BIRN investigation has sparked an official probe into whether the Pentagon broke the law by sending weapons to Syrian rebels through its German airbases. Weapons made in EU are widely exported and some to countries that engage in conflicts which threaten Europe’s own security. MEPs call on EU states to upgrade their rules on arms exports. Unter der Ortsmarke Picatinny Arsenal vermeldete die US-Armee am 6. September, dass sie Verträge im Wert von bis zu insgesamt 500 Millionen Dollar an vier Rüstungsfirmen vergeben habe, um Munition und Mörser-Systeme zu beschaffen, die nicht zur Standardausrüstung der US-Armee gehören. Gemeint waren damit, wie in den meisten Fällen, Projektile und Waffen sowjetischer Bauart. Das Picatinny Arsenal, ein Stützpunkt im Bundesstaat New Jersey, diente einst zur Herstellung von Munition, heute wird dort vor allem geforscht und entwickelt – und Beschaffungsvorhaben abgewickelt. A series of protests were conducted after a controversial decision made by the Ministry of Economy concerning the “Emco” arms and ammunition manufacturer. The ministry took the licensing of the firm which led to the termination of several contracts Emco had, including the contract with the government-owned company Kintex. In 2015 and 2016, Ukrinmash, a Ukrainian state arms exporter, signed deals with customers in Uganda and Burundi to sell 59 amphibious armored patrol vehicles. 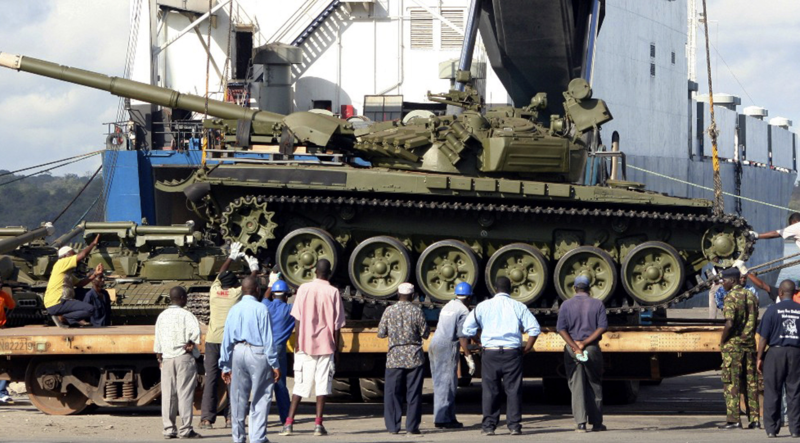 On the surface, the deals are typical of Ukraine’s arms trade with Africa, where instability and fears that weapons may migrate into conflict zones mean many countries have trouble buying from Western manufacturers. The Minister of Economy Emil Karanikolov is offering a reform in Bulgarian law that would make it possible for the state to take away licenses to arms manufacturers when there are storage violations. The current law is to restrict the shipments of such cases. The newspaper Hospodářské noviny reported this week that Czech-made military hardware – specifically a DANA artillery piece and an RM-70 rocket launcher– had been spotted in a promotional video produced by the army in Azerbaijan. However, the Czech Republic is one of several EU states that refuses to sell arms to the South Caucasus state in light of tensions between it and neighbouring Armenia over the disputed territory of Nagorno-Karabakh. A small airport on a Croatian island has become an important but unofficial logistical base for Pentagon shipments to the Middle East, likely including arms for Syrian rebels. The Swiss army knife is not the only weapon sold by Switzerland. The oldest neutral country in the world, an international peace broker famous for exporting cheeses, chocolates and iconic pocket knives, quietly sells arms on the global market. Le Mouvement réformateur s’est retrouvé jeudi au cœur des critiques à la Chambre après l’autorisation par le gouvernement wallon de 25 nouveaux contrats d’exportation d’armes vers l’Arabie Saoudite, en dépit d’une résolution du parlement fédéral, relayée par le ministre des Affaires étrangères Didier Reynders, invitant à stopper l’exportation d’armes vers la monarchie pétrolière.